Quilting and Life in General: Busy busy Fall! 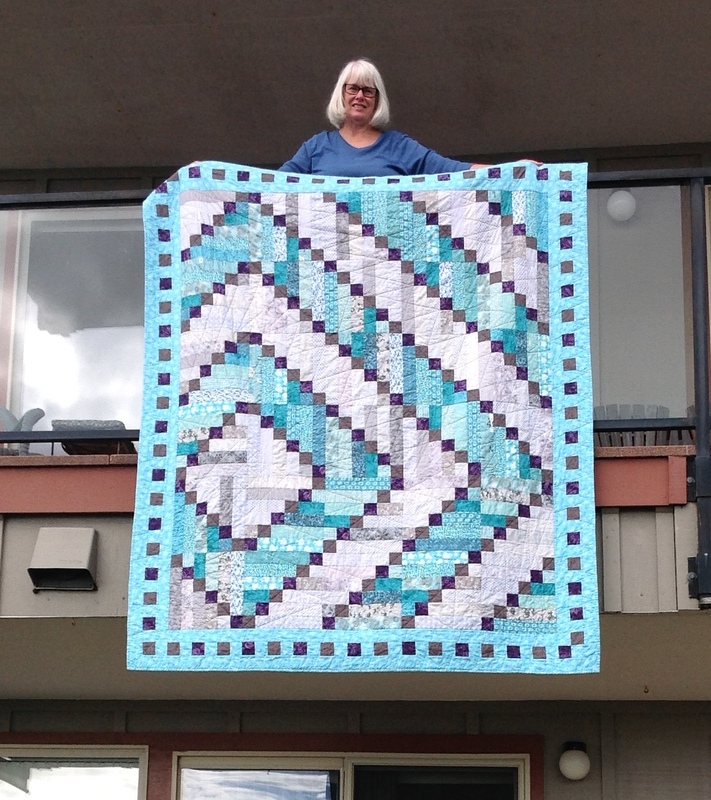 I'm pleased to announce that the Wedding Quilt is DONE!! (and the crowd goes wild!) The happy couple picked their colors ... teal, grey and purple. Oh dear, I had to go shopping!!! And I think I became attracted to teals and greys! Not good news for my stash storage or budget! 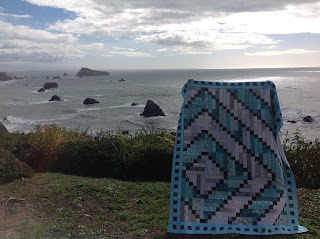 I used a free pattern online - Classical Elements and Illustrations offered by P&B Textiles. It was a good pattern. I very carefully cut out all the strips and squares. It pieced together very well. I added the border because I wanted it just a skootch bigger. And Voila! I thought I had a quilting plan, but when CY, a friend who is also an excellent quilter, saw it she suggested highlighting the diagonals. 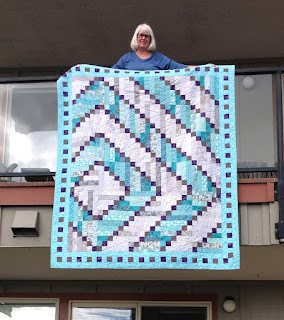 I quilted it myself on my DSM (domestic sewing machines for the non-quilters in the group!) It was harder than I thought it would be!! I have a pretty good setup for quilting. 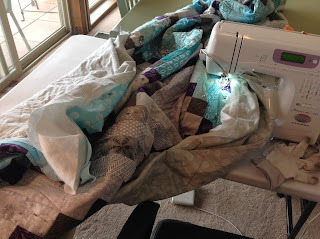 And although I have done free motion quilting, I do prefer walking foot quilting. Here I am in the dining room of the apartment. DH ordered a very large table when we moved out here. He wanted something large enough to still have room for a meal when I was in the midst of a project. Thank you, dear heart!!! 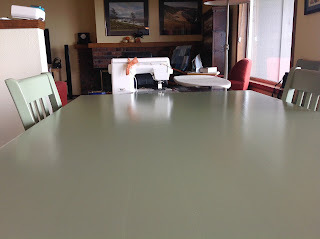 I have a portable sewing table that I can adjust the height, so with my acrylic 'sewing machine surround' (which increases the space around the needle so your quilt can be spread out a little more) the quilt moves smoothly onto the dining room table. You don't want gravity to pull it this way and that, distorting your stitches! Note that the foot pedal cord is wrapped around the leg of the table. That's to keep me from tripping on it or losing it way under the table!! 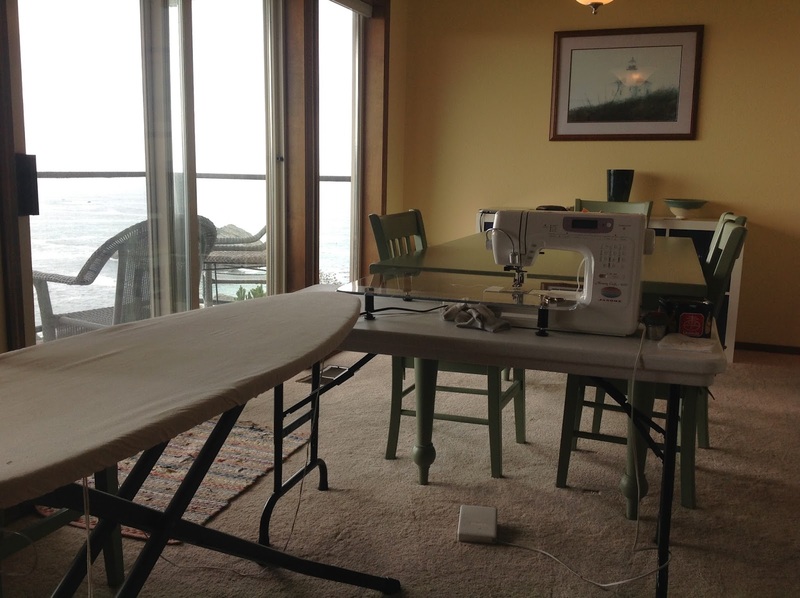 The ironing board keeps the majority of the quilt off my shoulders and off the floor while I'm feeding it through the machine. Looks pretty spacious, doesn't it! 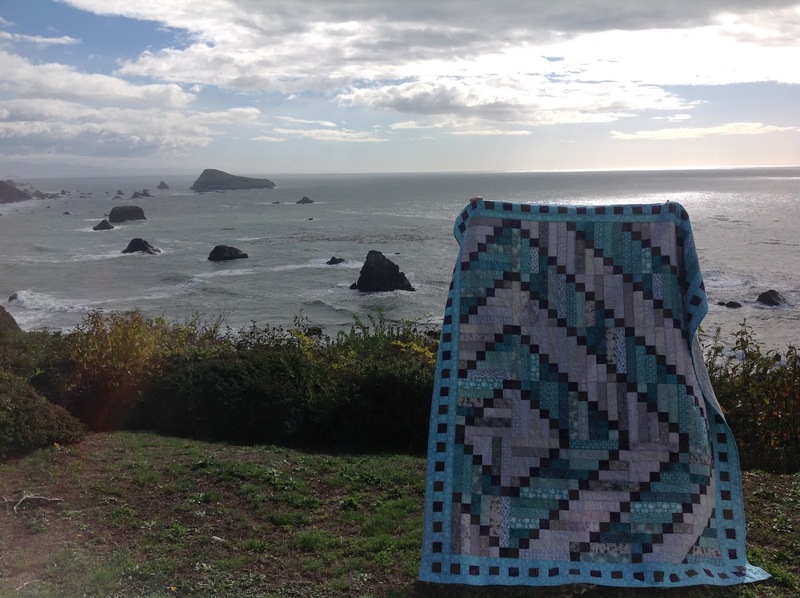 But then you add the quilt itself!! Not so much room now! 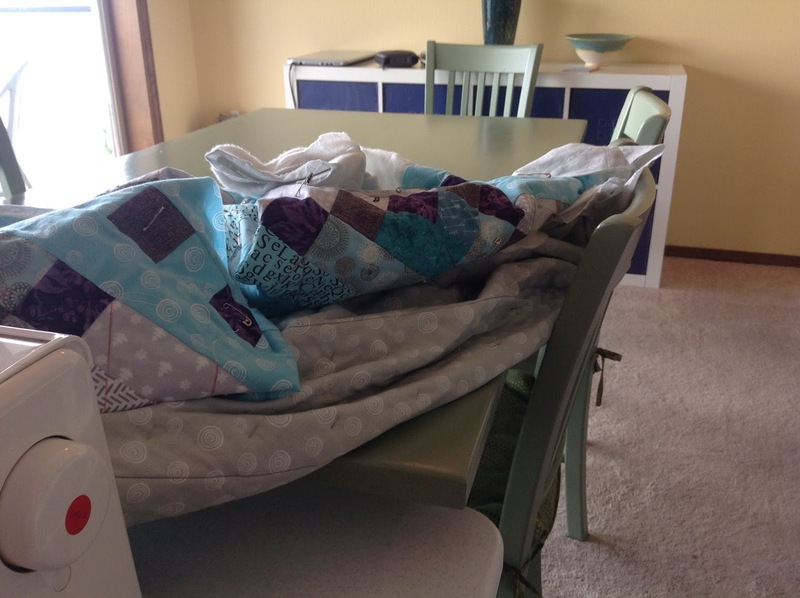 The chairs help to keep the quilt from falling off the table. Trust me, that quilt goes every which way as you work with it. The view from the other side, Hard to believe I use every inch of space!! 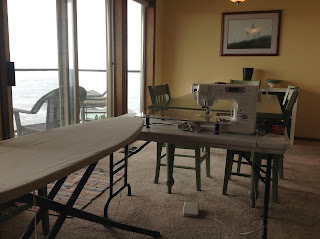 In fact, when I'm quilting, I encourage DH to go on a golf trip - and he runs for the door!!! It's the biggest mess you ever saw ... for days!!! I have a 6.5 inch harp (opening between the body of the machine and the needle. It's bigger than I've ever had before, but you have to squeeze the quilt through that opening during the process and trust me ... I think it's like mud-wrestling an alligator!! Ahhh, but the end result is oh so nice!! Don't you think?? DH thought we'd better have a shot of it with our ocean behind it! And yes, this is our view!! Life is good! I needed to go up to Portland to pick up my new glasses. So I planned an adventure with Miss P and Mr M. I love having 1-on-1 time with them. Or is it 1-on-2 time?? We can really get things done! IKEA was having a "Design a Stuffed Animal" contest. 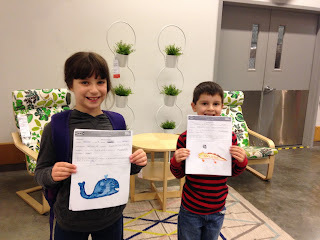 So Miss P and Mr M each designed some adorable animals for it. 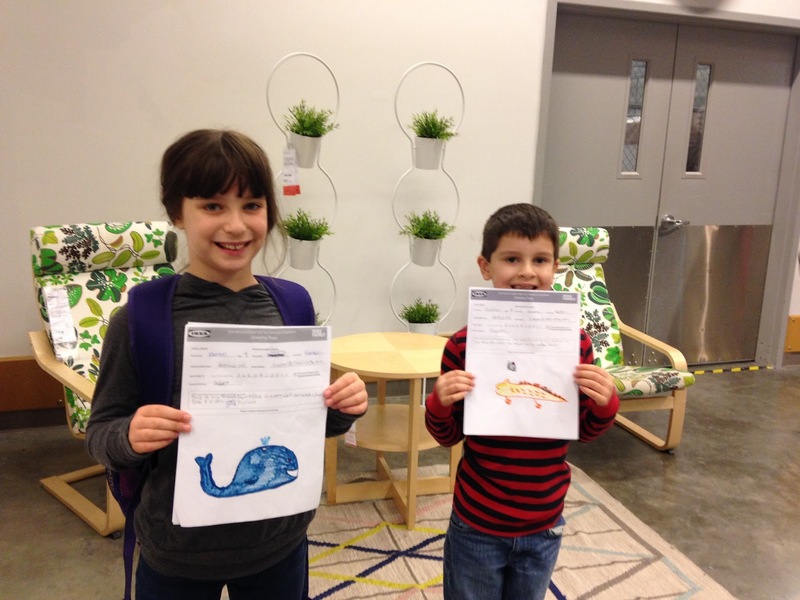 Then we packed up and went to IKEA to turn them in. BUT we went by the MAX or as I call it - the train. Other than the rain, we had an awesome day. Believe it or not, we sailed down Scholl's Ferry Parkway without a single red light!!! Not sure that's ever been done before!! Got to the Beaverton Transit Center lickety-split. Bought the tickets and the train was there! So far so good! The train we got on goes all the way to the airport so we didn't have to change trains downtown or anything! We had a great view out our window and it's always interesting to see a big city from a different point of view! 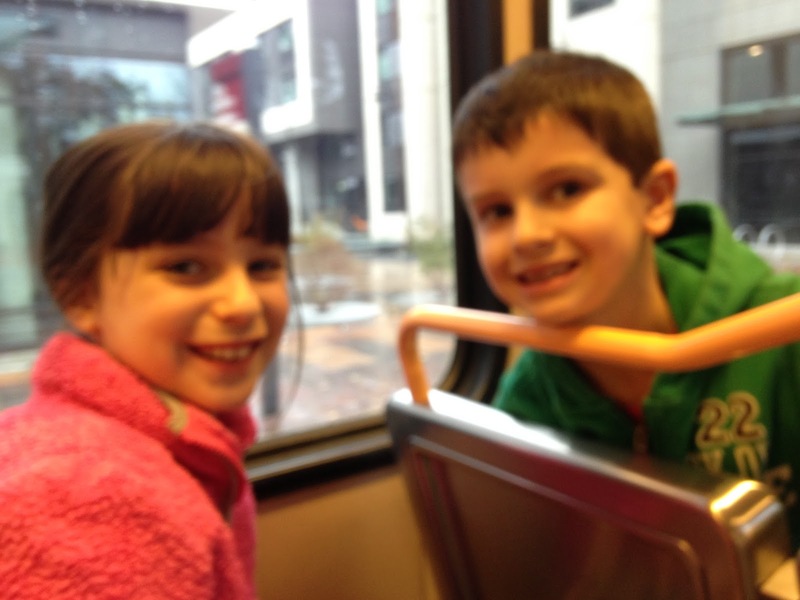 Sorry - I still can't take a focused picture when the train is moving! It took an hour to get to IKEA, and although that is longer than driving (some days!) there's never a guarantee that you won't run into a traffic snarl in Portland! We got off the train and walked across the parking lot to IKEA! Found the Customer Service desk and turned in our drawings. Then we went to check out the stuffed animals. The contest is a yearly event, and we saw the latest animals. Too cute! And we went over to the usual toy department. I had promised that we could get one stuffed animal each. When asked I said $15 max ... but I didn't see that 4 foot shark that was under $15!!! 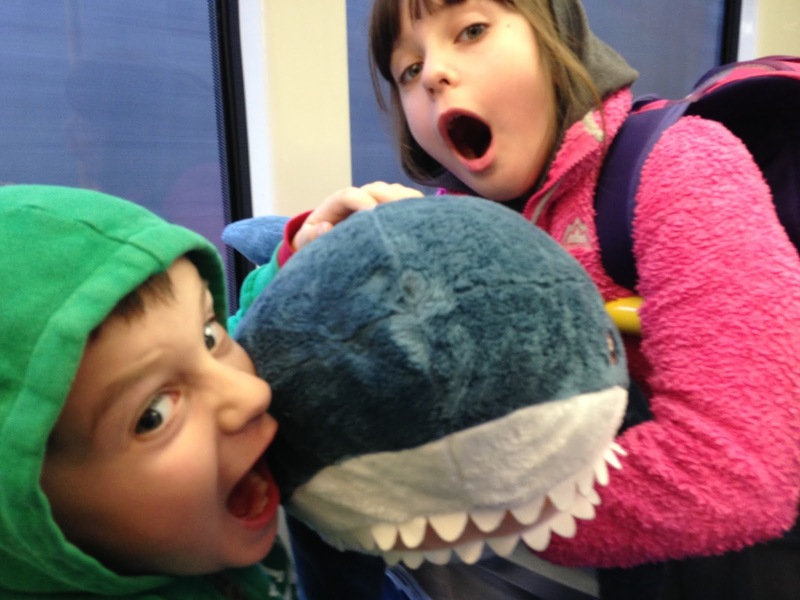 Mr M immediately decided on the shark and he's so cute ... what Nana could resist? He promised that he would carry it and take care of it! Miss P has a little harder time picking. She likes to pick the perfect new animal to fit into her other animals at home. She picked a snake, no, a polar bear, no, the shark, no, the Huskie, no the dachshund, and on our 3rd trip through, she settled on the Mamma and Baby Elephant. Good choice! We bought a few little things that Nana wanted and headed thru the checkouts then stopped for a yogurt cone. I thought we'd done wonderfully time-wise but it was later than I thought. Mr M was still eating his yogurt cone and it was still raining, but we had to head for the train. So Nana carried the shark, Mr M is a little too short to carry it thru rain puddles anyway!! He was done with his cone by the time we got to the MAX platform, and we didn't even have time to throw away the napkin and the train was there. Back in Beaverton, it was still raining, hard! We had a bout a 3 block walk back to the car. 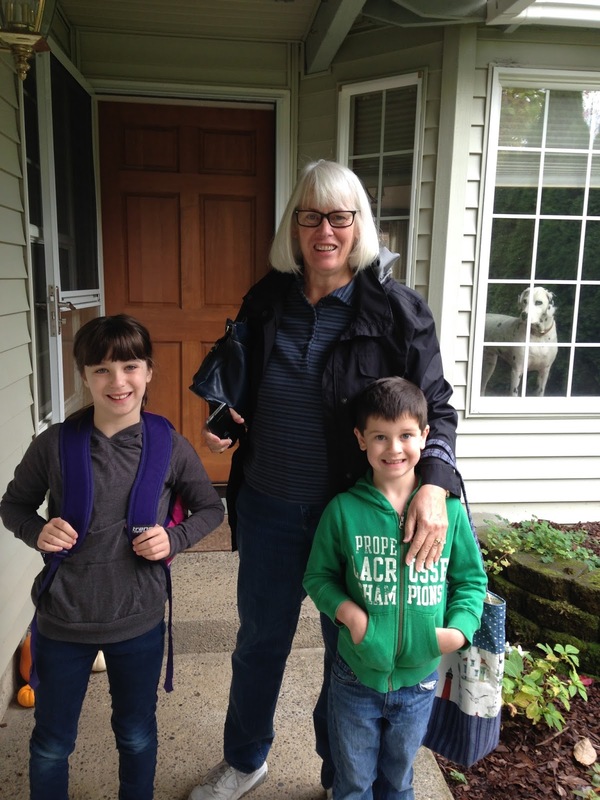 I had a shark under one arm, dragging two (a little whiny) kids by the hands down the street. I do believe I may have looked fierce enough that no one was going to mess with me!!! Later that day, Miss P wanted to write stories rather than color. What a great idea!! So we wrote and drew pictures of our day. Too fun. She wasn't done yet, but the last paragraph she wrote ended with "And then we had to put up with my brother's shark!!!" I think it was a success!! After only hearing about it, it's great to see the finished product. Love it! Just a brief moment to breathe! !